The Devil’s Candy is like no other book on film I’ve read. A former financial journalist, Julie Salamon was film critic for the Wall Street Journal when she gained access to Brian De Palma’s production of Tom Wolfe’s satirical novel. Her first idea was to give an industrial view of the filmmaking process and show the complexity of the contemporary cinema industry, and she does that, but she also wound up on the set of one of the most spectacular commercial and critical flops in the history of Hollywood. There are plenty of books – great books – about the art of film. There are books about the politics of the industry and the studio systems. And there are books of gossip about the ludicrous egos of everyone involved. The Devil’s Candy touches on all those areas, but where Salamon really excels is at showing the sheer number of different processes involved in a blockbuster movie. Detailed but never dry, she gives you a view of everything from the costume shop to the ever-expanding budget. Salamon follows the process from the first deals to the public reception of the film. She spends time with everyone from the location scouts to the director as they embark and then continue into disaster. That disaster shadows the book from its cover on, but Salamon never pre-empts her story: it’s only in the final third that you start to understand the sheer scale of it, and begin to feel something of the pain that might result from devoting two years of your life to a film that becomes an international punchline. You wouldn’t feel this way if The Devil’s Candy was all Schadenfreude (though Bruce Willis doesn’t come out of it well). Indeed, what keeps you engaged is the evident love everyone involved in the production has for the craft of filmmaking – Salamon included. Whether she’s following the Second Unit Director through the interminable process of filming a 10-second shot of Concorde landing (a shot the Director of Photography steals the credit for in the trade press) or judging the power relations in a debate on comic timing between De Palma and Willis, Salamon never fails to show the work that’s done, the people who do it, and how much the film finally means to them all. 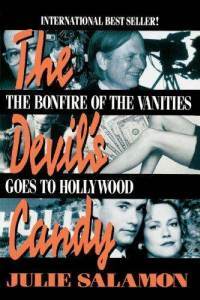 “The Bonfire of the Vanities” left a trail of maimed careers in its wake: in the twenty years since its release it has yet to earn back even a third of its budget. ‘Nobody realized it was going wrong when we were making it,’ De Palma would say later, with the air of a man who still doesn’t understand what happened. But who does? Salamon identifies some key bad decisions – in particular the production’s growing reliance on focus-groups and polling to drive the editing process – but the lasting impression is of a task that was impossible in the first place: to make a caustic satire with enough mass appeal to recoup a multi-million dollar investment. It also speaks to the mixed optimism and brutality of Hollywood. De Palma talked of making a satire as broad and as angry as “Dr Strangelove”, but as one money-man puts it after the first screening, ‘”Dr Strangelove” didn’t do so well.’ In the gap between the two ideas, a terrible fiasco was born. You haven’t seen it? Is that really true? It’s good. It is true! You think I’d get a lie past the fact checkers? One time when I made an unjustified statement about Fleet Foxes Indy made me rewrite – it’s like the New Yorker in the MostlyFilm office, you know. I started to watch it once but got very bored, very quickly, and I don’t think I even made it to the Concorde scene. The Concorde scene sounds bonkers. They wanted to shoot it so that the runway at JFK and the setting sun would line up perfectly. There is apparently only a 30-second window in the entire year when that happens. This fact makes me more likely to watch BotV than anything else I’ve ever read. I’ve never seen it, either. Or rather, I have a vague memory of Tom Hanks and a dog but nothing else. I thought I’d seen it, but I might be thinking of Big. I didn’t think Hanks was in it. I’d have read the whole book waiting for the bit where he gets sensationally sacked. I wonder if anyone even reads the book anymore. I gave it a go at university, when my tolerance for aggressively lengthy American novels was at its peak, but I don’t think I finished it. I thought it was written in astonishingly bad faith: it comes on like a beefy satire about corruption in the Wall St machine, but it actually turns out to be a pretty wet attack on (endlessly caricatured) wet liberals. I’d guess the book is pretty much forgotten now. I bought it in a Vintage reprint a few years ago and have never got around to reading it, or seeing the film. I have already read The Devil’s Candy once, though. I’ve read the book, but years ago. There’s an awful lot of, supposedly satirical, attention paid to one of the character’s neck muscles. It isn’t very good, as I recall. Yeah, there is something jerry-rigged about Wolfe’s ‘realism’. Characters can disappear for hundreds of pages at a time, but Wolfe leaves you what he thinks of as an indelible trait (the neck muscles) in the knowledge that you’ll remember who they are when they show up again. This is astonishingly crude writing, but then everything about Wolfe’s project is crude – even the good things (e.g. the genuinely interesting background research that he slams into the text unexpurgated). Oh, that’s a staple of American creative writing courses (which, actually, I’d be very surprised if Wolfe had anything to do with). Even the decent writers who’ve come out of the University creative writing world still do it. In Donna Tartt’s work, for example, characters are always given about ten physical or emotional descriptive markers when they are first introduced, and then at each subsequent re-entry into the narrative, she reminds you of two or three of them. It’s fine until you notice it, then it rankles. Wolfe is quite down on the imagination in general. He says, quite disarmingly, that he decided to become a writer because he discovered he had “a musical facility with words” and only then went about finding things to write about. He decided he couldn’t out-invent reality, so he decided to research it thoroughly and present what he found in fiction. These may be the only honest ideas he’s ever had, and I don’t hold them against him, but he misses that when Dickens (for instance) visited prisons and poorhouses he was doing it for personal reasons: he was provoking his imagination. The details he got from his research gave his imagination both scope and some scaffolding, but they weren’t the end of the story. In Wolfe, they are the story. I really like that. I just read a novel with an enormous cast and every 15 pages had to turn back and study what everyone had been like when they were introduced. Although I liked that too. The thing in writing that I really hate is loads of inging, just like I did there. I just annoyed myself. “Jeff smiled, his teeth gleaming, his laughlines deepening around his eyes.” I’m doing it for me now. I like the pain. Gave Ferris Bulers Day Off 0 out of 100. Back at ya Julie. I rate ‘The devils candy’ 0 out of 100. Bueller? No ‘fraid not. What I’m getting at is that I wouldn’t trust anything she’s written. As a WSJ movie reviewer, if you view her film reviews (at mediacritic.com), you can see that the majority of her rankings are totally reverse of consensus. She gave Ferris Buller (a John Hughes classic) 0 out of 100 before it had even started (read the review). So I’m going to give her book 0 out of 100 before I’ve bothered to read it. Heaven forbid a critic’s rankings are totally reverse of consensus. Well this was a fascinating book. I wasn’t even aware that the film had been such a flop, and if you hadn’t given it away here, I don’t think I’d have guessed. Sure there are crazy moments of Hollywood indulgence, but that’s doubtless true of many successful films. The conclusion from many of those involved is that the source material was never going to make a decent movie – the big names and big money just added to the sense of hubris. I liked the book, but what I liked about it was the big canvas descriptions of the way things worked – trading, judiciary, media etc. In when I was watching The Wire it reminded at times of Bonfire. But that had five series to paint a picture of Baltimore’s machinations, not two hours. I do wonder if a different edit and an absence of focus groups would really have saved it. Still, I will have to watch the film now.